Rainy season means loads of fresh crispy vegetables. Thats what exactly hit me when I entered the famous Mombasa Vegetable market this week. Just couldn’t make up my mind as to what to buy. Wanted to buy the whole market. The deep green fresh broccoli kept on beckoning me to buy her, him? I can eat raw broccoli, blanched, in soup form but I hate boiled broccoli. So it was broccoli salad for dinner on that day. The recipe is very easy to make and a nutritious one. Go on make it, you will love it. Put some water to boil in a pan. Add the broccoli and let it cook just for 2-3 minutes. Drain out the broccoli into a sieve or colander. Run it under cold tap water. Roast the nuts in a pan over low heat till they turn light brown. Stir frequently. To prepare the dressing, mix the oil, honey,vinegar, salt, pepper and onion very well. 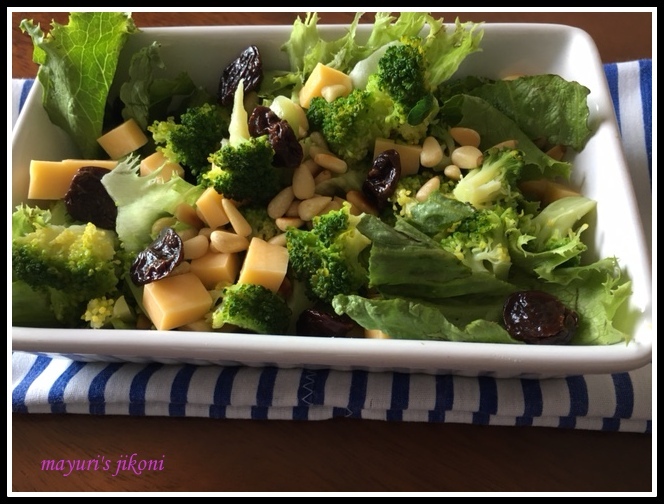 Mix broccoli, lettuce, cranberries and pine nuts in a bowl. Pour the dressing over it and serve. Can use any other nuts like cashew nuts, almonds, peanuts, etc if you do not have pine nuts. Can add any dried fruit of your choice, dates, figs, apricots etc. Use mayonnaise as a dressing if you like.